People who appreciate the classic and elegance will be impressed by Seattle City Impression, the classic rounded case, which is in 39mm, could firmly grasp people’s attention. Different from the monotonous smooth bezel on general watches, City Impression adopts hobnail bezel, unique design shows the distinctive elegance of the whole watch. Dauphine hands are slender and elegant, black pvd plated and stainless steel hands match the dial in different color separately. There is also yellow hands on golden watches, looks dazzling. The fullness of the dial is from the 12 varnish coating color, each coloring must be absolutely flawless. All processes must be completed in a dust-free space, it is a great challenge to watchmaking skills. Different from the monotonous smooth bezel on general watches, City Impression adopts hobnail bezel, unique design shows the distinctive elegance of the whole watch. 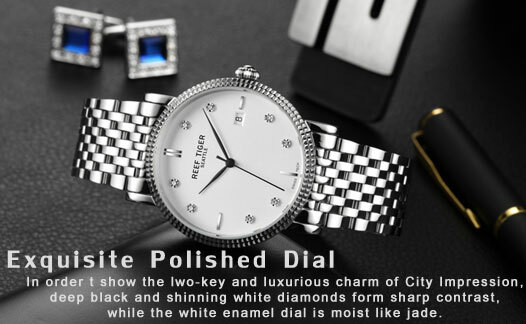 In order t show the lwo-key and luxurious charm of City Impression, deep black and shinning white diamonds form sharp contrast, while the white enamel dial is moist like jade. 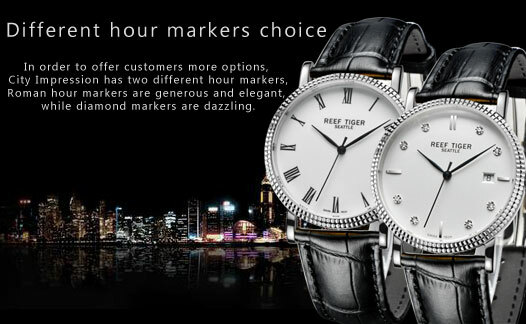 In order to offer customers more options, City Impression has two different hour markers, Rome hour markers are generous and elegant, while diamond markers are dazzling. Dauphine hands are slender and elegant, black pvd plated and stainless steel hands match the dial in different color separately. There is also yellow hands on golden watches, looks dazzling. Every piece of diamonds on the dial is selected from Swarovski Elements, with four-claw setting technology and unique inlaid approach, each side of the diamond hour markers is perfectly shown in your eyes. As a business mechanical watch, the movement is the soul of the whole watch. 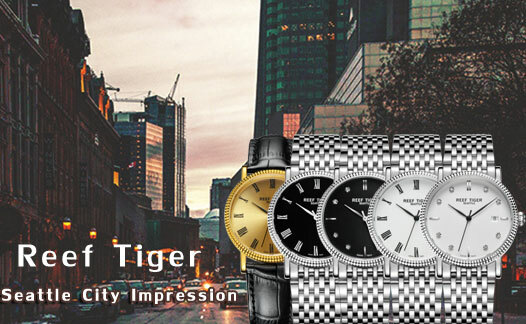 City Impression adopts transparent case back, so the operation of each movement part is shown in front of your eyes, to let your witness the passage of time. 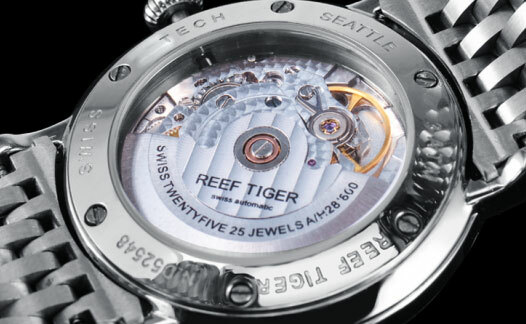 The watch adopts RT7101 movement, after being adjusted by Reef Tiger watch masters, its inaccuracy is controlled within 5 seconds. In polishing, the plates edges are round and smooth, each screw, spring and gears are shiny, very beautiful.